UNUSUAL: Police have appealed for information. An investigation has been launched after sneaky thieves completely removed the front door of a flat during a break-in. The unusual incident occurred at a block of flats on Liberty Road, Bellshill, sometime between 10.30am and 6.30pm on Sunday (November 22). Police say the culprits simply removed the front door to gain entry and then swiped a 40” TV. The theft was discovered when the occupants returned home and discovered the door sitting in its frame. 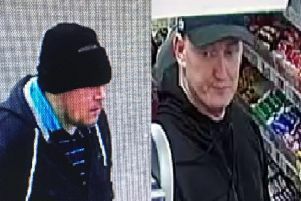 PC Garry Cook of Bellshill police office said: “This is a highly unusual break-in and I would urge anyone with information to get in touch. “The door appears to have been removed cleanly, with no signs of damage or force. The occupants returned home to find it sitting loosely in its frame. Anyone with information is urged to call Police Scotland on 101 or Crimestoppers free and confidentially on 0800 555 111.